100mL 3.4oz This fab fragrance captured the spirit of an era that was carefree and fun. This recreation of the original scent has been painstakingly developed by a team of perfumers at the original oil suppliers and after many trials and tests it has been approved by the original creator of the Aqua Manda fragrance, Christopher Collins, who has acted as an advisor on its relaunch. 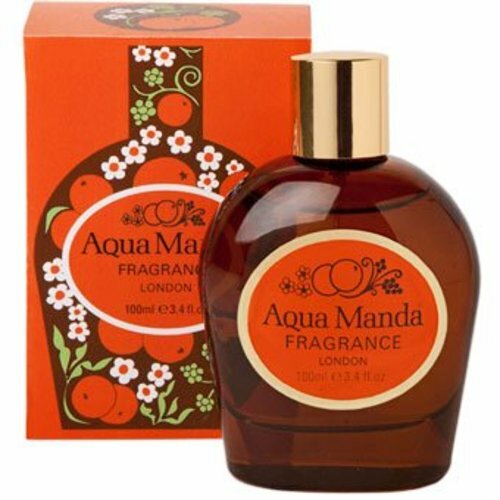 Aqua Manda Perfume is made with essential oils of mandarin, ginger, lavender, patchouly, cinnamon, and other aromatic herbs (Eucalyptus, tarragon and juniper berry). The fragrance has a top note of Mandarin with an Oriental base note. A refreshing and lingering fragrance for day time and evening wear, Aqua Mandas oriental and spicy scented base notes provide the perfect fragrance for any occasion.